“Without the Bible, we would not know of His Church then, nor would we have the fulness of His gospel now” (Ensign, May 2007, page 81). “Our message is unique. We declare to the world that the fulness of the gospel of Jesus Christ has been restored to the earth” (Ensign, May 2007, page 88). Indeed, Mr. Perry identified the medium through which the fulness of the gospel was restored: The Book of Mormon. “…the Lord brought forth the Book of Mormon, another testament of our Lord Jesus Christ. This ancient volume of holy scriptures is a sacred companion to the Bible, containing the fulness of the everlasting gospel of Jesus Christ. It also provides convincing evidence to the world that Joseph Smith is truly a prophet of God” (Ensign, May 2007, page 86). The question arises, then: Which of these men, both of whom Latter-day Saints sustain as prophets, seers and revelators, was correct in his teaching at the April General Conference? Mr. Ballard taught that the Bible is necessary in order for the fulness of the gospel to be present on earth today. He could have meant that the Bible contains the fulness of the gospel (as the Introduction to the Book of Mormon affirms), or he could have meant that the Bible and the Book of Mormon together contain the fulness of the gospel. Either way, his teaching was not consistent with what Mr. Perry taught. Mr. Perry taught that the Bible does not contain the fulness of the gospel. Though the world has long had access to the Bible, the fulness of the gospel was missing; it needed to be restored — which it was, through the Book of Mormon. 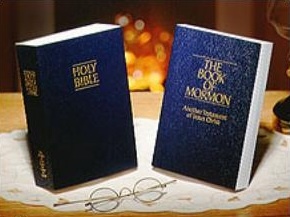 Mr. Perry taught that the Book of Mormon, by itself, contains the fulness of the gospel (which is also consonant with the Introduction to the Book of Mormon). “Because of the New Testament, Joseph Smith was inspired to pray. And because he prayed, the gospel was restored in its fulness and we now have the Book of Mormon, Another Testament of Jesus Christ” (Charles Didier [then general president of LDS Sunday School], Church News, 1/7/95, page 3). “…the Book of Mormon remains secure, unchanged and unchangeable, …But with the Bible it was not and is not so…it was once in the sole and exclusive care and custody of an abominable organization, founded by the devil himself, likened prophetically unto a great whore, whose great aim and purpose was to destroy the souls of men in the name of religion. In these hands it ceased to be the book it once was…our present Bible contains only a fraction of the holy word that once was compiled with and included in it as the acceptable word of the Lord” (Bruce McConkie, The Joseph Smith Translation, The Restoration of Plain and Precious Things, pages 12, 13, 16). “This Jewish Bible was deliberately altered by the great and abominable Gentile church, which took ‘many plain and most precious parts,’ and ‘many covenants,’ and much gospel out of the book (1 Nephi 13:27). The alterations were done early, for it was after the Bible was altered that it went ‘to all the nations of the Gentiles’ (1 Nephi 13:29). …To rescue the world from this spiritual blindness, the Lord [brought] forth the Book of Mormon and other books to ‘make known the plain and precious things that have been taken away’ from the Bible (1 Nephi 13:35-40)” (Church News, 11/8/2003, page 5, report on the BYU Sidney B. Sperry Symposium on the Scriptures). It is clear that, according to Mormonism, the Bible is lacking the fulness of the gospel. Notwithstanding Mr. Ballard’s praise for this volume of scripture, for many LDS leaders the Bible takes second place to the Book of Mormon — if not third or fourth. Living and active, sharper than any two-edged sword, piercing to the division of soul and of spirit, of joints and of marrow, and discerning the thoughts and intentions of the heart (Hebrews 4:12). Did you mean “consistent” instead of “consonant” at the end of paragraph ten? I like this line, “the Book of Mormon remains secure, unchanged and unchangeable”. Granted, there are some of dot dot dots before and after that sentence but I would love to see any context that could rescue such a bogus claim. Also, I like how forward Bruce McConkie in his view of historic Christianity. I just wish more Mormons today could be so consistent and forthright. Sharon, Here’s where you made your mistake in your presentation above; you used the word “consistent” as in “not consistent”. This is Mormonism we’re talking about here. It is not necessary to be consistent. If prophet “X” says “blah, blah, blah” on Sunday morning and prophet “Y” says “bloh, bloh, bloh” on Sunday afternoon on the same topic, it doesn’t matter. They’re both right and anyone who dares to point out a seeming difference is attacking the Mormon church and the prophet(s). You see folks, it’s all about having that “internal witness” that “feeling” that the BOM is true. The Bible provides a nice supplement, it would seem, as long as it supports the BOM. And falcon captures this mentallity well, and the article, Sharon, gives more proof. As I was reading Sharon’s artice, I thought about an old Saturday Night Live bit where two people are standing in a kitchen and one is holding up an aerosol can of Jiffey Whip. First actor: “Jiffey Whip is a great desert topping.” Second actor: “NO! Jiffey Whip is a great floor wax.” They go back and forth until Chevy Chase walks in and in his best announcers voice says, “Hay stop it you two. Jiffey Whip IS a great dessert topping AND a great floor wax.” I think the application to Mormon “truth” is obvious. In a recent thread I challenged Mormons to provide examples of the Bible being inaccurate, etc. Again, would any Mormons care to point out specific places in the Bible where “many plain and precious truths” were lost? On another topic, maybe I’m being too nit-picky here, but Mr. Ballard stated that when Jesus was alive he named his followers ‘The Church of Jesus Christ’. I’m just going on my faulty memory here, but I don’t remember Jesus giving his followers any title or label. Can anyone give an example of doing that? Also, the earliest Christians in the Bible did not use the ‘The Church of Jesus Christ’ label for themselves. They referred to themselves as ‘The Way’. Since Mormons claim to have the supposed lost integrity of the earliest Church, perhaps they should use ‘The Way’ as their title? Just musing here. As if the two LDS cannot agree lets add more confusin to that with what BY said. I think it is really confusing for BY to say what he did, Knowing that the Bible was “Corrected” by JS from a revelation of God (IE), The J.S.T of the Bible. So Elder Ballard’s talk is saying that the Bible maintained the teachings of and belief in Christ through the centuries, however twisted and wrong they became, so that when the right person came along God did not have to ‘start from scratch’ but had a basis – that of Christianity – to use to introduce His true Gospel into this earth again. Thus, because of the Bible Joseph Smith prayed and received the First Vision, then went on to restore the fullness of the gospel to the earth. Without the Bible this would never have happened – so without the Bible, we would not have the fullness of the gospel now. As for the ‘prophet, seers and revelators’, as far as I understand, the Quorum of the 12 are sustained as such AS A QUORUM, NOT INDIVIDUALS. They can only act as such when The Prophet (right now Pres. Hinckley) has died or is incapacitated. Apart from that they are only apostles in their callings and duties. It is The Prophet who has this calling as prophet, seer and revelator at all times. Out of curiosity, could you tell me where the LDS Church says that members of the Quorum of the 12 have to be speaking out of a group decision for what they say to be treated as doctrine? Yeah, i heard in last general conference say that the apostles were all sustained as prophets/seers/and revelators.. they arent? I’m sorry but it’s quite a reach to say that the Bible contained the truth but the truth became twisted through the centuries until Joseph Smith dug up the gold plates which, incidentially, he didn’t even use when he wrote the BOM. I read the Bible and I don’t see Mormonism in it….any where. Mormonism and the Christianity of the Bible aren’t even distant cousins. I think the apostle Paul and other writers of the new testament were clear as to what the Church is, and it isn’t what Mormonism is. Paul writes about the Gospel of Jesus Christ being revealed to him by God. Nothing in his writings about a restored priesthood, multiple gods, eternal progression, temple rituals and on and on. A far reach won’t even get Biblical Christianity to Mormonism. OK, I have made a small mistake with what I wrote – like I said my understanding. Because of your questions I looked it up. The members of the Quorum of 12 are prophets, seers and revelators, however as the next 2 quotes show, they are subject to the prophet in this capacity – meaning as I wrote earlier, they do not function as such unless the president is incapacitated or he tells them to. …the First Presidency and Quorum of the Twelve are commissioned by God and sustained by you as prophets, seers, and revelators, with the President of the Church sustained as THE prophet, seer, and revelator, the SENIOR Apostle, and as such THE ONLY MAN AUTHORIZED TO EXERCISE ALL of the revelatory and administrative keys for the Church. Jeffrey R. Holland, “Prophets, Seers, and Revelators,” Ensign, Nov 2004, 6. ‘Some of the General Authorities [the Apostles] have had assigned to them a special calling; they possess a special gift; they are sustained as prophets, seers, and revelators, which gives them a special spiritual endowment in connection with their teaching of this people. They have the right, the power, and the authority to declare the mind and will of God to his people, SUBJECT TO THE OVER-ALL POWER AND AUTHORITY OF THE PRESIDENT OF THE CHURCH. Others of the General Authorities are not given this special spiritual endowment.’ The resulting limitation ‘applies to every other officer and member of the Church, for none of them is spiritually endowed as a prophet, seer, and revelator.’ “The Twelve Apostles,” Ensign, November 1996, 6. Falcon, do you not agree that there are many churches (LDS included if you want) that have twisted and distorted the gospel around to suit themselves, and some of these were before Joseph’s time? They all believe in the Bible but they have their own interpretation of it. This is what I mean. I’d be interested in some examples of the many churches that have twisted and distorted the gospel to suit themselves. Just for conversations sake. I call churches that do this apostate and the leaders heretics. Most recently Jim Jones of People Temple and David Koresh of the Branch Dividians. That’s why God calls us, and Jesus warned us, to be vigilant and defend the faith. Paul writes so eloquently about this to Timothy. There are doctrinal standards on the very basic issues of Christianity that are clearly taught in the Bible. As Christians we are called on to use discernment to recognize when some teaching or revelation does not line-up with the Word of God. When it doesn’t we are to expose it and oppose it vigorously. Mormons often claim that after the supposed “Great Apostasy” the pure truth of the Bible was compromised, along with peoples’ ability to interpret the scriptures objectively. But one thing I have never heard them talk about is the fact that from its very beginning Christianity has battled heresy. We can find examples of this right in the Bible. In Galatians Paul refutes the Judaizers, who were Jewish Christians who believed that OT ceremonial practices were still binding on the NT Church. Paul wrote Galatians to convince his readers that the Judaizers’ claim was an abandonment of salvation by grace through faith. In Colossians Paul attacks heresies that may have been the pre-cursor to gnosticism. I point all this out because Mormons are constantly claiming that after the early Christians died off heresy emerged and destroyed everything. But we see in the Bible that the Church battled heresy right from the beginning. If heresy made it impossible for people to interpret doctrine correctly after the Apostles died off, why can one not say the same thing for those Christians living during the NT time? In any case, I would also like examples of the “many churches that have twisted and distorted the gospels”. The only way Joseph Smith could make his “new” Christian religion work, was to claim that the existing orthodox Christian Church had fallen away from the original faith of New Testament times. His invention can’t work without that claim. The problem is, his religion doesn’t appear in the New Testament. There’s nothing in the NT to suggest that to get to the highest level of heaven, you need to practice plural marriage. While Paul discusses some general guidelines for worship services, there’s nothing in the NT about temple rites. So I think these contradictory statements regarding the Bible, is a casting about for where the Bible fits in in Mormonism or to give the Bible lip service in order to gain some credability. What’s really important in Mormonism is continual on-going revelation by “prophets” who really aren’t held to any Biblical standard, examination or criticism. This is from what I have learned from my Catholic and Anglican friends, NOT from my church. Peter (NT apostle) gave the authority to someone to lead the church just before he died, thus establishing the line of authority of the popes. The Catholic church was the only Christian church at the time, but 2 centres of control came into being, Rome and Greece. The 2 Bishops/Priests who presided over these centres called the other a heretic and excommunicated them, bringing into being the Roman Catholic and Greek Orthodox churches. So here was the first split and difference in doctrines of Christianity I know of. So one of them had doctrine which was ‘twisted or wrong’ according to the other one. From past postings about the Nicene Creed, there were a number of differing ideas about God and Jesus and their Deity, indicating that there were some twisted and wrong doctrine at that time in the Christian church. The Arian community were considered heretical (ie twisted and wrong doctrine) after the Creed was completed. Martin Luther posted his theses stating where the Catholic church had twisted the doctrine, which started the Protestant movement. In the beginning of this movement the Catholic church considered all of the other churches that were springing up heretical and tried to get rid of them. According to the Catholic church these Protestant churches had twisted and wrong doctrine. Since both sides thought the other had incorrect doctrine only one could be correct, or none, but not both. Each splinter of Christianity has charged its progenitor with having ‘twisted and wrong’ doctrine while the original does the same with the offspring. Again meaning that only one is correct or neither. Even though these days most are trying to become ecumenical and establish a repartee with each other, in the beginnings of each there were the charges of apostasy and heresy. So yes I can claim that there was twisted and wrong doctrine within the Christian churches at the times. I’d be interested in some examples of what this “twisted or wrong” doctrine is/was and where that brings us today in terms of orthodox Christian doctrine. Also, I think your implication is that since heresy crept into the Church, the Gospel needed to be restored, thus Joseph Smith. The problem with that scenario is that Mormons can’t prove via the Bible that what they currently believe is what NT Christianity was all about. It’s not in the New Testament. That’s why I think Mormons have this precarious standing with the Bible. My impression is that if the Bible doesn’t line-up with Mormon doctrine, the Bible, in the eyes of Mormons, is not quite up to snuff. But Ralph, as I said in my last post, heresy has been a problem that has dogged the Church since day one. Heresy did not suddenly spring up after the original apostles died. The NT is replete with examples of the NT writers dealing with the problems of false teaching. If one says that doctrine was attacked and twisted after the first century, one would also have to admit that there was also heresy during the time of the NT’s formation. But here’s something to think about: whenever Mormons point to the heresies of the past 2,000 years (of which there were many, as there are today), they are putting the burden for the endurance of the church on human beings. I think Catholics also inadvertantly do this with their focus on apostolic succession (which as far as I know the Bible does not say is necessary for the endurance of the church). No, we don’t depend on faulty human beings for the universal Church enduring to the end. We depend on Jesus for that, who is the chief cornerstone. The Bible promises us this in Matt. 16:18, Matt. 28: 18-19, Eph. 1:22-23, Eph. 3:21, and especially Heb. 12:28 “Therefore we are receiving a kingdom that cannot be shaken”. So when Mormons say that it was necessary for the Church to be restored because of heresy, they have entered the realm of conjecture. They are going against what the Bible says (nothing new, of course). Jesus promised that his Church would endure to the end. And that’s who I believe. I am not arguing about there being heresy/false doctrine in the Christian community – we all agree that there is some. You both asked me for examples, so I gave you the blanket example of whenever there was a split in churches – eg Catholicism and Protestant – both claimed the true doctrine and the other had twisted the doctrine around. Yes, from the beginning there were false doctrines creeping in and the true believers tried to remove it by teaching the true principles and pruning the dead wood. So again we agree about that. As for the question about which doctrines were twisted and wrong – well we are discussing many of them on this website – but for example the identity/persona/character of Heavenly Father is one. LDS believe that the common Christian Trinity is corrupted doctrine – you Christian believe that the LDS view is corrupted, but only one of us is correct. Faith/grace/works is another. But as I said, we are discussing many on here, so I wont list them all. But one question I have is those of you who believe the Roman Catholic Church is corrupted and not true, because it is thought of as the ‘original’ Christian church, why do you not believe in a full and general apostacy, because until your ideology/theology came into circulation, it was not there and worshiped thus there was no full truth? Just trying to understand your viewpoint. I think when we talk about apostasy, it comes in a couple of different forms. There is a type of apostasy that is institutional that really doesn’t have much to do with doctrine. I was raised Catholic and left when I was twenty years old because of the hypocrisy and goofiness that I saw within the institution. Later I began to look at things from a theological point of view and I can point to doctrine and practice within Catholisism that I think is off the mark and that which I’m OK with. It’s really not that difficult to go back to the NT and extract the essence of the original standard doctrine and practice. That’s why examining Mormon doctrine and practice is a fairly easy exercise in terms of seeing if it lines-up with the NT. The only way Mormonism works, in my opinion, is to believe in the special messenger who gave a special messeage approach. Because frankly it doesn’t come from the Bible, hence the subject of the original article here. OK, Falcon needs to spell catholicism ten times! Sorry if I didn’t explain my question too well but it was more about before any groups split off from the Catholic church, not this day and age. If the Catholic church is doctrinally wrong (which some of you on this site believe), did it occur before any splinter Christian groups formed to ‘keep’ the truth? If so doesn’t this constitute a full and general apostacy? If the Catholic church was not corrupt at the time of the splintering then aren’t the splinter groups incorrect? If the Catholic church was not the first church in Christianity then why is it claimed as such historically? All these questions are subject to the historical claim of the Catholic church to being the first Christian church and that it was correct in all facets at the beginning. If this is not the case can some one please point me in a direction which can tell me a bit more about the ‘evolution’ of Christianity. All I have here are Catholic, Anglican and Protestant friends who all hold to this ideal about the Catholic church being the first Christian church. My take is that the Catholic church was really not the original church. It became the first, big organized one, and took over the Roman Empire before it split. But see Acts 2: 42-47 for a better description of the original church. And one could argue the Catholic church maintained a godly worship until the Renaissance. Also, everyone, another point that Joseph needed to separate his church apart was the priesthood. An article at the host– mrm.org– details this. http://www.mrm.org/topics/historical-issues/priesthood-restored-or-retrofit. The article discusses how the priesthood did not appear until a few years after Joseph formed the church. This is very much a cornerstone of the Mormon faith now, and it would be safe to assume that along with the church would come the priesthood preceding the church. This is evidently not the case, and is problematic. Ralph, whenever Mormons speak of the Great Apostasy they point to the heresies present at that time as proof of total apostasy. But they never do the same for the NT time. That’s why I mentioned it. You have good questions about the Catholic Church. I think if one were to look at the earliest church that still exists it would probably be the Eastern Orthodox church. Unfortunately I don’t know enough about this subject so I will have to do some reading. One thing you wrote really stuck out to me–“until your ideology/theology came into being”. The theology I adhere to is that which is found in the Bible. It did not emerge in the following centuries after the apostles died off., as Mormons claim. There are some areas in the Bible in which Christians can “agree to disagree” (ie., when there seems to be evidence for differing viewpoints). But in the essential doctrines (ie., nature of God) there is no room for disagreement. These are the same doctrines the apostles believed. I think one thing to mention is there are different meanings for the word “church”. One example would be a specific church, such as a particular church in a town. Another example is the Catholic Church, as a denomination. The church the Bible refers to, and the one Jesus promised that would endure, is the catholic (small ‘c’ meaning ‘universal’) Church. Every person who confesses Jesus as their LORD (Romans 10:9–when LORD is used in all caps in NT to refer to Jesus it means YHWH, God) and expresses their salvation in a regenerate life is a member of this worldwide, universal Church. Hey guys, it’s been awhile. It seems hypocritical, since your OWN roots and history are BASED on the claim that the catholic church perverted Christs’ gospel, that you would reject the possibility of His gospel being perverted. Why wouldn’t the devil attempt to pervert ANYTHING in his reach? And since the priesthood was no longer on the earth to speak in God’s name, these translations were easier to manipulate–and were. And don’t try and argue this, the Reformation itself was based on this claim. Many Reformers themselves claimed no authority but just said that the status quo wasn’t quite right because they experienced and witnessed for themselves the corruption of the word of God. Amanda, no one is denying that there have been numerous examples of heresy since Jesus founded his Church. Of course the devil attempts to pervert God’s truth. What I disagree with you on is the claim that the devil was/is succesful in his endeavors. While people can distort God’s truth, the integrity of His truth is secure because it rests with Him, not human beings. We know that the Church could never have been destroyed because that is what the Bible promises us. Did you look up the references I left in my first comment on Nov. 11th? I know you are extremely busy–small kids and pregnant–but at least take a look at what the Bible says on this issue. Also, how many versions of the BOM are there? The edition you have today is not the same one of 100 years ago. It is not biblically sound to depend on one’s individual feelings on whether or not the BOM is true. One should compare its contents to the Bible first. The BOM contains doctrine contradictory to the Bible (in other words, heresy). Check out the first chapter of Galations: “I am astonished that you are so quickly deserting the one who called you by the grace of Christ and are turning to a different gospel–which is really no gospel at all. Evidently some people are throwing you into confusion and are trying to pervert the gospel of Christ. But even if we or AN ANGEL FROM HEAVEN should preach a gospel other than the one preached to you, let him be eternally condemned!” (Ga. 1:6-8). Still have that peace? Amanda, quoting the BOM to prove Joseph Smith as a prophet of God will do no good. Those passages could have been easily made up by Joseph Smith as a way to get lay members like yourself to think some guy way back when prophesied of people refusing any other scripture except a Bible..
That is the perfect way to undercut the Bible and what it says clearly (like Ga 1:6-8 quoted above) to inject “new found” scripture into the world. Amanda, From what I understand from my discussion with Megan and Falcon, they believe that Jesus established His doctrine and followers on this earth while He was here – which constitutes the original church. It was not institutionalised until the Roman Catholic (or Eastern Orthodox as Megan wrote) came along. It was the institution that became apostate, not the believers. So it was through the believers that the doctrine remained on this earth, not through any institution. Which is how they can believe that there was no great apostasy as we believe. So the true doctrine was on this earth all the time and the Evangelical ideology is from this doctrine, so it was not a case of it stemmed from the Reformation period as you have said, its has been and was always there – the Reformation period is when people decided that the institutions were apostate and that the true doctrine was in themselves. Megan and Falcon, please correct me if I am wrong because I am trying to understand your view. Ralph, this is my view pretty much exactly. I don’t know what the first formal institutional church was, though. Others on here may. I think the first formal institution is the religious community that today is the Eastern Orthodox Church. Insitutions aren’t inherently bad or unbiblical–but when they have heresy they are. I don’t think the Catholic Church during the Reformation was totally apostate by any means. But it did have a lot of corruption and some heresy. At least it always had the biblical view of God, though! Incidentally, Martin Luther didn’t intend to found a new denomination. He originally posted the theses to promote discussion and change within the Catholic Church. It was only later that he decided to cut loose. I don’t know exactly what you mean though about ‘the true doctrine was in themselves’. The true doctrine is found in the Bible, and it has always been up to people to accept it as true or not. But its endurance and integrity rests with God, not with human beings. While God has endowed his Church with blessings, authority, and responsibilities, its existence and endurance is sustained by God. I should have been more specific about something. Religious insitutions are made up of members. Many of the members (ie., many clergy) in the Catholic Church at the time of the Reformation were apostate, but that doesn’t mean the entire insitution was apostate. Know i’m not supposed to do back-to-backs! Well, another post from me. Ralph, I can’t stop thinking about our “conversation”. I wanted to write a few more things about that. I think you’re too caught up with the whole institution thing, which makes a lot of sense. Mormons believe in grace plus works, and these works are always within the context of the LDS Church (going to the temple, keeping the Word of Wisdom, etc.) And then the Catholic Church claiming to be the original Church is doubly confusing. I don’t know if the Catholic Church was the first institutionalized church. It really doesn’t matter. I’m not trying to knock the Catholic Church, but this is an issue I have always disagreed with them on. When Jesus spoke of the endurance of the Church, he meant worldwide believers, not any particular institution. John 1:12 says, “Yet to all who received him, to those who believed in his name, he gave the right to become children of God–children born not of natural descent, nor of human decision or a husband’s will”. So this verse tells us how to become part of God’s family. In the first chapter of 1 Cor. Paul speaks of the factions present in Corinth. “..One of you says, ‘I follow Paul’, another, ‘I follow Apollos’, another, ‘I follow Cephas (Gk. for Peter); still another, ‘I follow Christ.’ Is Christ divided? Was Paul crucified for you? Were you baptized into the name of Paul?” My study Bible informs me that in Corinth during that time feuding groups developed around rival leading figures who may have hosted different house churches. Here Paul is saying that simply being a follower of Christ is what matters. Those verses you quote makes me think of how beautiful a personal relationship with Christ is. You and God, that’s it. Nothing from this world mixed in. A spiritual connection with your redeemer. He chose to save us even though we are sinful. Nothing sounds sweeter to me. Alright, I’m embarrased to be on here again already. I promise, I do have a life! I thought of something else to share with you, Ralph. (Looking forward to your take on things). I was looking through my Bible later today at the John 1:12 verse, and I missed a note I had written down there. The word translated as ‘right’ in the NIV and ‘power’ in the KJV is from the Greek word ‘exousia’. The words ‘right’ and ‘power’ come close to the Greek word, but ‘exousia’ means ‘authority’. So, with using the Greek word, one could read the verse as “Yet to all who received him, to those who believed in his name, he gave the ‘exousia’ (authority) to become children of God.” All who accept Jesus as LORD (ie., God) have the authority to be his children. This is a good verse to keep in mind with reference to the Mormon teaching on the Great Apostasy and the priesthood. We have authority because Jesus has given it to us. Yes Megan, you have the authority to become His children – it says nothing about the priesthood. If you wish to believe that it does mean priesthood then that is your perogative. But without explicitly saying priesthood in the verse, I can say that you are reading into it and giving your own interpretation. Plus being a child of God and the adoption of us as children of God are two different things in the LDS church, so you will need to be careful with this to avoid confusion or arguments. As simply as I understand it, Heavenly Father is our spiritual father and thus we are His children. When it discusses adoption in the Bible, it means that we become adopted by Christ as He is the Father/Author of our salvation. I could be wrong in this as it was a while ago that I learned about it – I will look it up later tonight and see if its correct. As for the part about the believers having the true doctrine in themselves, from my understanding from comments made on this website and others that I have spoken to, the Holy Ghost is indwelling and that is what brings the truth into you. Yes its perpetuated from God, but its in you once you have accepted Christ as your Saviour. If I am wrong please tell me more – I truely am trying to understand. I have to hand it to some of you, I don’t know Greek or Latin (or very little with what’s necessary for my work). I have learned Finnish and so I know what its like learning another language. I would love to learn those languages and be able to read/study the Bible that way, but right now I have very little time. Ralph, I went to a friends’ house tonight (they are LDS) and we talked about the verse I cited. One of my LDS friends said something very similar to what you did. I can see why you have that interpretation of that verse when you believe in pre-existence. I believe that verse is referring to adoption as God’s children in the context of salvation. I know that verse is not referring to the priesthood, which is a separate issue. Oh how I wish this thread was on the priesthood, because then I could share a lot of references! LDS care very much about authority, (wrapped up in the priesthood of course), and I was using that verse to establish my authority as God’s adopted (saved) child. (I know you don’t believe I have any authority because of the supposed complete apostasy). The Bible refers to believers as God’s adopted sons, with all the rights, privileges, authority and responsibilities of that culture. That is what I believe the verse is saying. Don’t be misled–I don’t know Greek, Latin, or Hebrew. I have a good study Bible which gives the Greek words for some of the text. I also have Bible doctrine books which do the same thing, and we have a Greek/English dictionary for the NT. So you, too, can quote Greek with abandon! It’s kind of fun to do it. But in all seriousness, it’s very helpful to get the full meaning from the Greek/Hebrew. Kind of like a book that was originally published in French is not exactly like its translation. Your Holy Ghost comment clarifies what you meant by “the truth in them” statement. Thanks. Ralph, as far as I can tell I believe we are on the same page in reference to what you wrote about the Holy Spirit. I forgot to say that in my last post yesterday. I do read and study the Bible. However, I am not sure why I need to use the Bible as a standard (or YOUR interpretation thereof) of judging the Book of Mormon…the Bible itself requires a belief in order to validate its’ message. Even still, my study of the Bible has not questioned my testimony of the Book of Mormon- they are both the word of God. The only proof we have is the miracle that comes after living by faith. Often that miracle is a distinct testimony of such things. I have tried my faith in both books, and found both to be complimentary and both to bring me closer to God. I read the Galatians passage you posted, I’m not exactly sure how it challenges my “peace”. I could apply that scripture to your position as well, Megan. I will say, I am grateful for those who love the bible, and love God. They make good neighbors, friends and missionaries. There is much good being done in the world because of the faith of evangelicals (and other denominations). If we could recognize the good in each other more often, we might also recognize the truth, wherever it is.